Two weeks after House Republicans stuck anti-abortion language into — of all things — an education bill, the GOP has yet again transformed a seemingly innocuous bill into a controversy. On Tuesday, it was revealed Senate Republicans added abortion restrictions into a human trafficking bill that, when first introduced, had bipartisan support. Now, the Senate is once again divided down the pro-abortion rights/anti-abortion line — further delaying resources to human trafficking victims in the process. 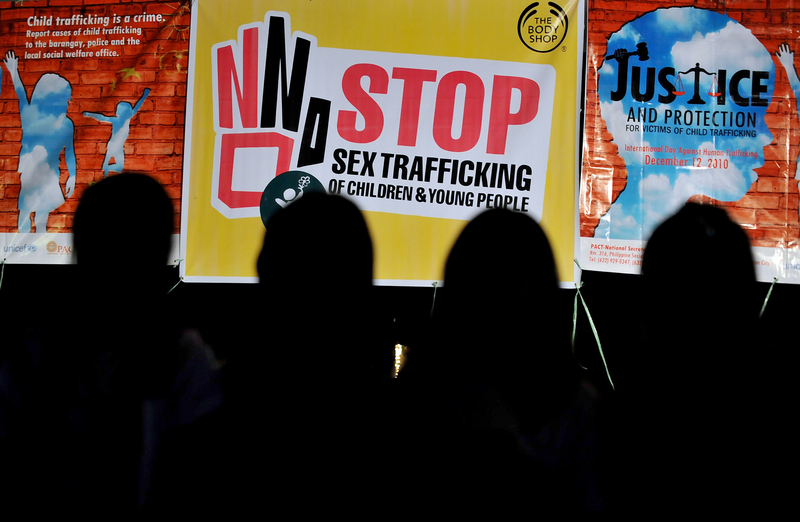 The Justice for Victims of Trafficking Act would increase penalties for those convicted of human trafficking and sexually exploiting minors, while also creating a Domestic Trafficking Victims' Fund from the collected fines. It's difficult to find fault with a bill like this, but Senate Republicans did the seemingly impossible: they politicized the bill by tacking an abortion restriction onto the victims' fund. It's a move that many abortion rights advocates say will limit human trafficking victims' access to reproductive health care in a time when they may need it most. "Human trafficking survivors, overwhelmingly young women, deserve to have all reproductive health options available to them," Kate Stewart, vice president of public affairs for Advocates for Youth, said in a statement sent to Bustle. "This move by politicians is an underhanded attempt to harm women most in need." Although the bill doesn't include the word "abortion," it does state that the victims' fund would be subject to the same limitations "on the use or expending of amounts described in sections 506 and 507 of division H of the Consolidated Appropriations Act, 2014 ... to the same extent as if amounts in the Fund were funds appropriated under division H of such Act." That's a direct reference to the Hyde Amendment, a provision that bars federal taxpayer funding, such as Medicaid, from covering abortion procedures. Historically, Hyde has only applied to public funds, but this provision would now impose abortion restrictions on fines and fees collected through criminal convictions. It's a whole new way for lawmakers to block funding for abortion, particularly among young and abused women — many of whom may even be underage. Democratic senators, who had no knowledge of this anti-abortion language until this week, claim this bills is a tactic to expand the Hyde Amendment and further penalize low-income women or women in vulnerable positions. Adam Jentleson, a spokesperson for Senate Minority Leader Harry Reid, told The Washington Post that the bill's Hyde language could "lead to a dramatic expansion of abortion restrictions in future years." However, Senate Republicans contend that this is nothing new — after all, many Democratic politicians have been in support of the Hyde Amendment for its nearly 40-year existence. "Democrats have supported legislation consistent with the Hyde Amendment for a long, long time," Senate Majority Whip John Cornyn said on the chamber floor on Tuesday. Reproductive health advocates have been working for decades to repeal the Hyde Amendment, which is not yet permanent law and has to be renewed by Congress each year. Currently, just 15 states provide Medicaid funding through their own coffers for abortion procedures, leaving the majority of low-income women in America with little to no financial resources for terminating a pregnancy. With Hyde expanded through the human trafficking bill, advocates say trafficking victims may be unable to receive affordable reproductive health care. "No woman should have her decision about abortion made for her because she can’t afford medical care," Kierra Johnson, executive director of United for Reproductive & Gender Equity (URGE), said in a statement sent to Bustle. "Especially those emerging from exploitation and in need of comprehensive health care like trafficking survivors, who are overwhelmingly young women." "It's inexcusable, even more so given the high rates of sexual abuse experienced by Latina survivors," added Jessica González-Rojas, executive director of the National Latina Institute for Reproductive Health. "In a bill designed to support survivors of human trafficking, they [Senate Republicans] press for coverage bans that make abortion unaffordable."